Elder Dallin H. Oaks of the Quorum of the Twelve invited college-age young adults to "consider and teach" the "twin ideas" of truth and tolerance. "We believe in absolute truth, including the existence of God and the right and wrong established by His commandments," Elder Oaks said in a Church Educational System broadcast, which originated Sept. 11 in BYU's Marriott Center. 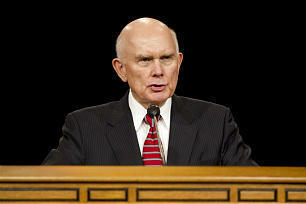 "It is well to worry about our moral foundation," Elder Oaks said. "We live in a world where more and more persons of influence are teaching and acting out a belief that there is no absolute right and wrong, that all authority and all rules of behavior are man-made choices that can prevail over the commandments of God."